Gravy Train were a progressive rock group active from 1969 to 1975. The British quartet blended the English classic rock sound with progressive movements on their last album Staircase to the Day. 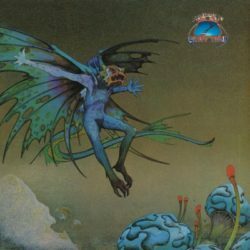 Everything was great about this work, the artwork by designer Roger Dean, the fantastic detailed songs and the excellent vocals. Opening with the dynamic track “Starbright Starlight”, a quite memorable tune. It’s just one of the many highlights which you’ll find on this album. “Bring my life on back to me” is a power ballad with delightful guitar and gospel style choruses. The synthesizers, mellotron and funky riffs are blended together very well on the many impressive pieces.